The Cronkite News documentary "Hooked: Tracking Heroin's Hold on Arizona" and digital packages with more information on the problem are available on the website hookedaz.cronkitenewsonline.com. PHOENIX – Having all television stations air a Cronkite News documentary Tuesday about heroin’s hold on Arizona is a big step toward raising awareness of the drug’s dangers and how to seek help, the head of the Arizona Broadcasters Association said. 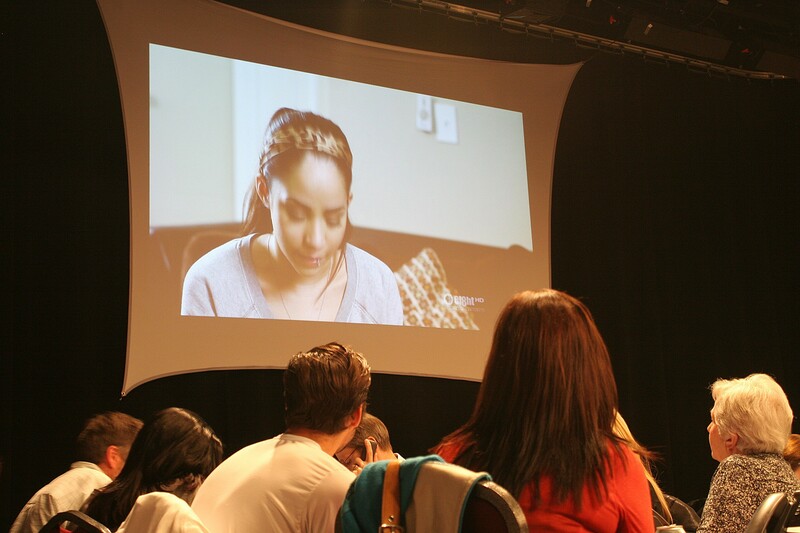 Dozens of students at Arizona State University’s Walter Cronkite School of Journalism and Mass Communication created the 30-minute documentary “Hooked: Tracking Heroin’s Hold on Arizona” in collaboration with Brooks’ group. At 6:30 p.m., the documentary aired simultaneously on 33 local TV stations in Prescott, Phoenix, Tucson and Yuma as well as 93 radio stations. A version for Spanish-language outlets aired at 5. A website with the documentary and more stories on heroin in Arizona is available at hookedaz.cronkitenewsonline.com. The Arizona Broadcasters Association sponsored a call center for viewers seeking counseling or more information on heroin and opioid addiction. 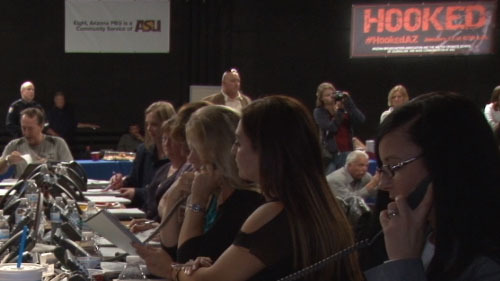 About 100 trained counselors manned phones in an Arizona PBS studio. “I know we’re going to save a life tonight,” Brooks said. Michael Frazier, police chief in Surprise and one of those interviewed for the documentary, was at the call center. He said he’s a firm believer in prevention. A Cronkite News analysis of hospital discharge data from the Arizona Department of Health Service’s Bureau of Public Health found that between 2009 and 2013 heroin drug overdoses nearly doubled in the state. Lauren Loftus, a Cronkite School graduate student who produced an accompanying digital story on first responders such as doctors and paramedics, said her goal was showing what it’s like to be treated for a heroin overdose. “If you’ve never been on drugs and you don’t know what it feels like, it kind of takes you through what that’s like from the moment you shoot up, to the moment you wake up in an ambulance,” she said during a panel discussion after the documentary aired at the Cronkite School. Andy Hill, a former Phoenix police officer who Brooks said helped inspire the project, said a friend’s 22-year-old daughter died after her boyfriend persuaded her to use heroin for the first time. 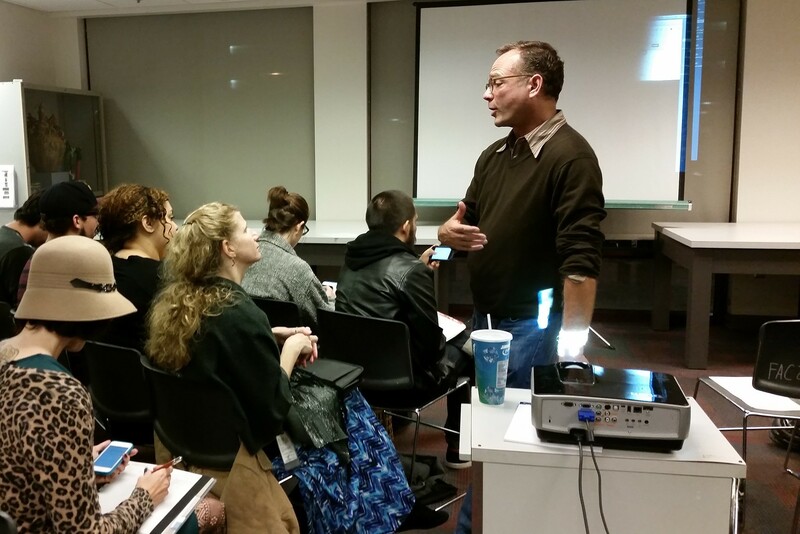 “In order to solve or make an impact on something, you have to start with making people believe in something,” he said. Cronkite News reporter Sydney Schuman visits the busy phone operators volunteering their time for those seeking help with heroin. Volunteers man phones in a studio of Arizona PBS in Phoenix as the Cronkite News documentary "Hooked: Tracking Heroin's Hold on Arizona" airs. 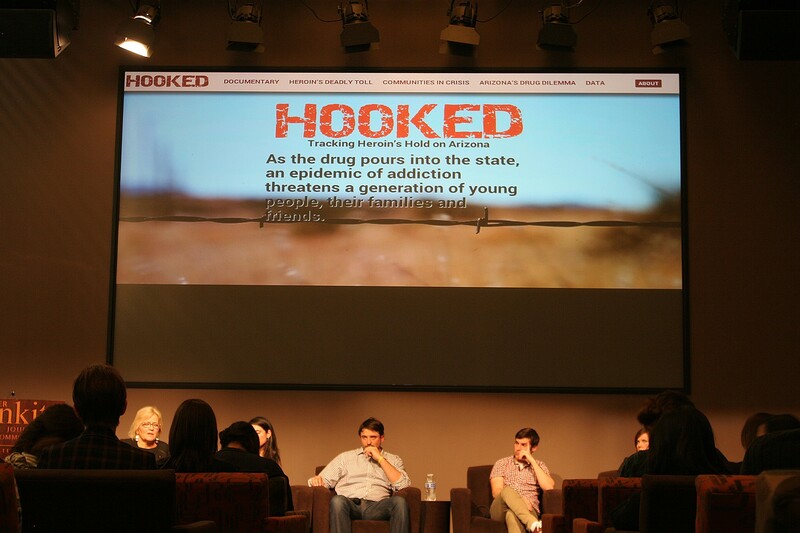 Cronkite News journalists who helped create the documentary "Hooked: Tracking Heroin's Hold on Arizona" participate in a panel discussion Tuesday night at Arizona State University's Walter Cronkite School of Journalism and Mass Communication. 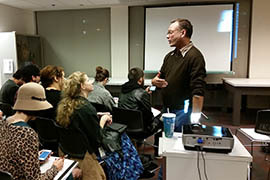 Gregory Sale, an associate professor of intermedia and public practice, speaks at a screening of "Hooked: Tracking Heroin's Hold on Arizona" at Arizona State University in Tempe.